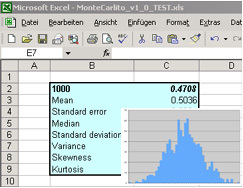 MonteCarlito is a free Excel-add-in to do Monte-Carlo-simulations. Download MonteCarlito, open it in Excel, turn on macros, and follow the instructions in the spreadsheet. Please contact info@montecarlito.com for feedback and bug reports.